Good evening, space fans! Welcome to this week's observations on outstanding news from orbit. Congratulations are in order for the three crewmembers of Expedition 42, which concluded successfully on Wednesday. 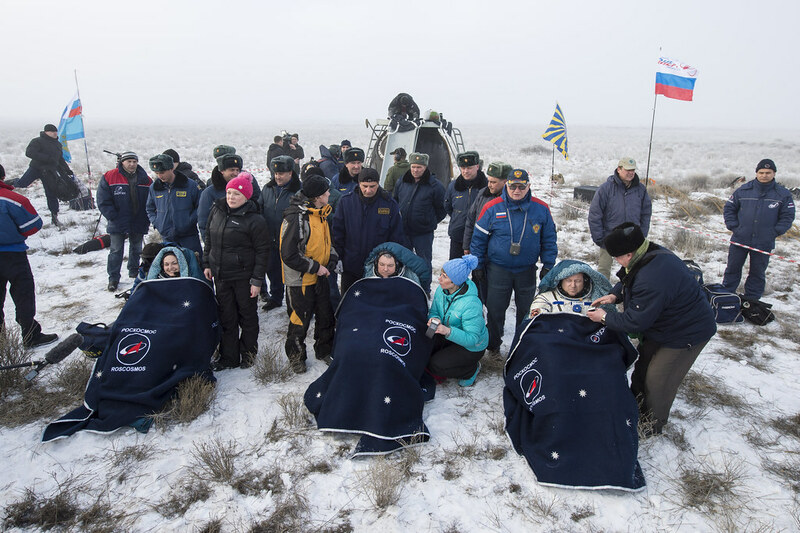 ISS Commander Barry "Butch" Wilmore and cosmonauts Yelena Serova and Alexander Samokutyaev landed safely near Dzhezkazgan, Kazakhstan and were extracted from their Soyuz TMA-14M spacecraft with no complications. Expedition 42's Soyuz spacecraft, headed for home. 9:20 PM - Deorbit burn complete. 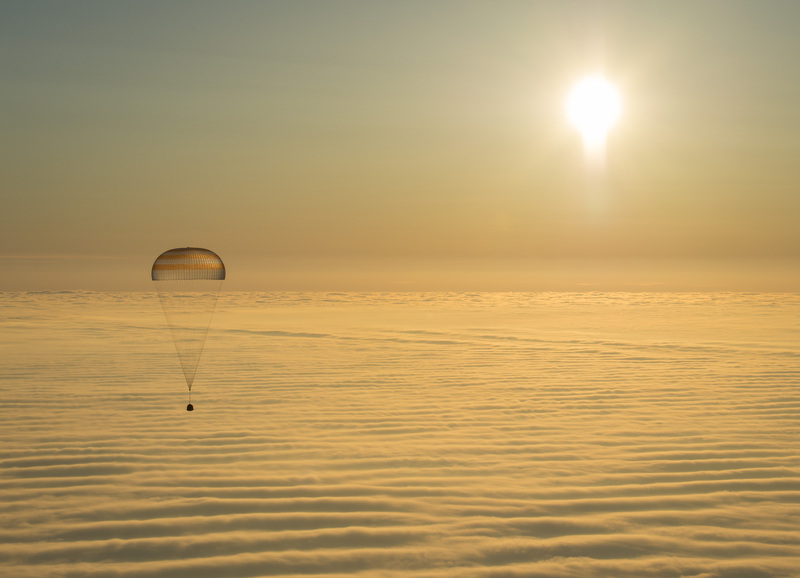 10:07 PM - Expedition 42's Soyuz TMA-14M lands safely, southeast of Dzhezkazgan, Kazakhstan. until they can regain their "Earth legs" in regular gravity again. Expedition 42 mission lasted 168 days and included three major spacewalks from Commander Wilmore (along with his crewmate Terry Virts.) Additionally, cosmonaut Serova had been a unique addition to the station, having been Russia's first female to work aboard the ISS, and only their fourth woman in space in their nation's history. And she even kept her eyebrows neatly plucked while up there. What a lady! Before leaving the ISS, Wilmore handed over command of the station to his compatriot Virts, explaining, "As we say in the Navy, you have the helm!" Despite the fact that Virts is a colonel in the Air Force (possibly making this a lighthearted inter-branch jab from Wilmore, a captain in the Navy), he has taken the helm with aplomb. Altogether, 258 investigations were carried out during the Expedition 41-42 mission, ranging from small but crucial experiments like CubeSats, running all the way up to working with the station's Alpha Magnetic Spectrometer. CubeSats are very small satellites that are currently being launched once per month via the Japanese airlock. The most recent "flock", released earlier this week, contained 28 of these satellites, measuring a mere 4" by 4" by 12" each. 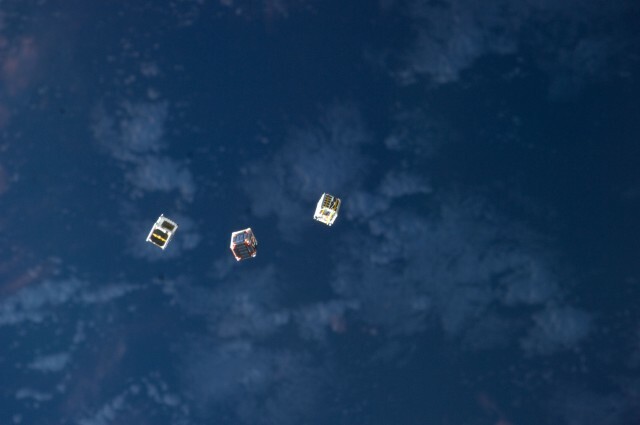 Some cute little CubeSats go about their mission. These mini-satellites provide near-realtime imagery to various sources on Earth, rather than larger, more expensive satellites that require major initiatives and time-consuming issues to align them into desired place. The CubeSats, by comparison, aim for a 24 hour data turnaround. Their small size and relative affordability make them an attractive option for student groups as well as private organizations. Despite their diminutive size, the CubeSats have a resolution of 10-15 feet per pixel, making it possible to identify specific swaths of Earth imagery, such as a single tree canopy or other areas of interest to science, business, and more. Other Expedition 42 science experiments including Butch blowing bubbles, which are apparently the same in space. Another focus of Expedition 41-42 research included work on the Gene Lab, a "protein data bank" containing data from various organisms regarding how their genes change in micro-G, according to NASA's Dr. Vic Cooley. Constant additions will be made to the data bank, including information from organisms that are hatched/born in space as well as those that are grown on earth and flown to the ISS. Of course, lots of amazing imagery was captured by the astronauts, but some very particular pics were taken of the moon as part of the mission. The moon imagery requirements the astronauts fulfilled are to be used as a backup for navigation by starlight, much as how ancient mariners used to find their way. Since atmospheric distortion from Earth was unable to get in the way, the ISS crew took photos of space including the moon to use as a brightness calibration for star visibility. The star charts are intended for use as backup should any long-duration space missions have catastrophic navigational issues. Other science that got sent home on the Soyuz included data from radiation dosimeters aboard the ISS, as well as information from a study on the regenerative properties of worms living in micro-gravity. Both studies will be assessed concerning their possible impacts for humans in space. Stars of the stars. Congratulations on a successful mission, Expedition 42! Meanwhile, back on the home planet, astronaut Scott Kelly and cosmonauts Mikhail Kornienko and Gennady Padalka are gearing up for their March 27th flight to the ISS. Kelly and Kornienko are part of a groundbreaking (spacebreaking?) study in which the pair will spend a full year on the space station. Kelly is of particular interest in this experiment, as a "control" experiment will be concurrently carried out on earth with his twin brother, Mark. Comparisons and contrasts will be made between the biology of the two men to determine the myriad ways that extensive spaceflight can impact the human body. The mission is being devotedly documented by NASA, with a cache of information already available regarding the One Year Mission. Updates will also be documented on Twitter at #YearInSpace. Finally, while acting as the interim ISS Commander, Terry Virts has got a special mission all of his own. A serious sports fan, Virts intends to photograph every major league baseball stadium from his box seats in the sky. Virts intends to post photos from 250 miles above all of the 28 MLB stadiums, challenging fans to identify their parks of preference from multiple-choice lineups. Virts hopes to raise awareness of space science and the ISS's utter awesomeness via the project, which will appear on his Twitter and Instagram feeds as well as under #ISSPlayBall. 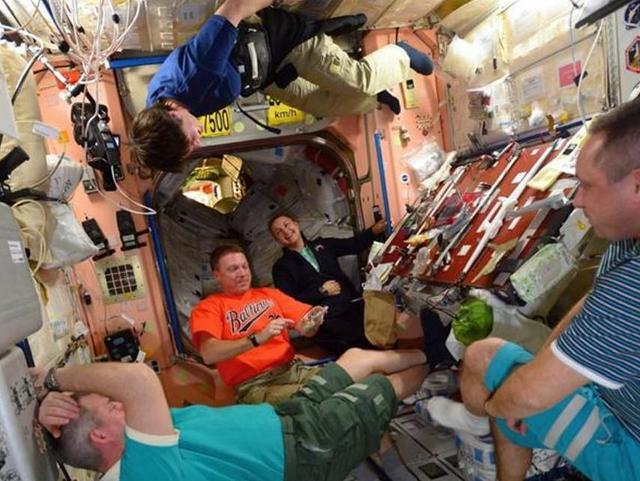 An Orioles fan, Virts rocks a Baltimore jersey aboard the ISS. That's all for this week, space fans! Tune in next Sunday for more news from Earth's greatest orbital outpost. Watch this space! Lovely day for a landing! 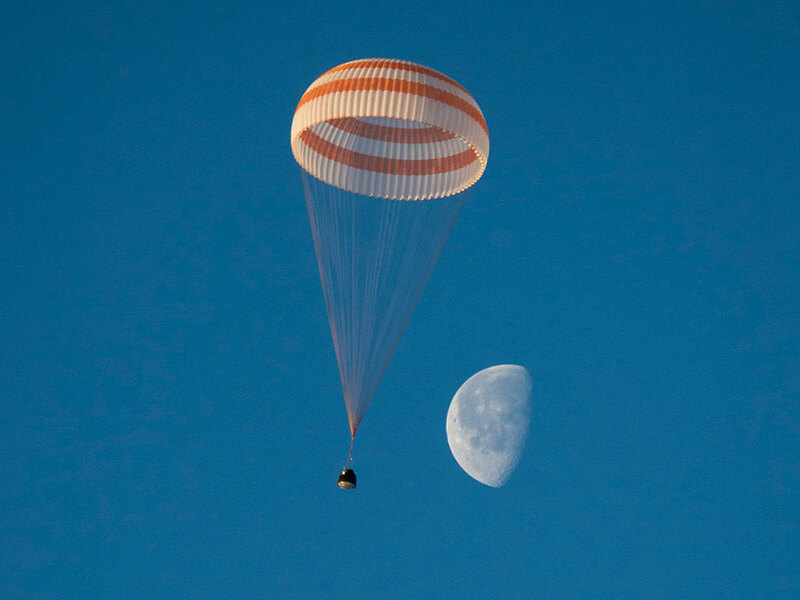 Expedition 42's Soyuz spacecraft floats homeward. Seems that space - not so boring as teachers in school told us :) I wait for the day, when space trips will become public and cheap. Nice week review, thank you. Absolutely! As soon as it's possible to report from space, I'm up for it! Thanks for reading! It was a great interesting and informative article it got a lot of good quality facts in it. I don’t think EduBirdie are a safe place to order from. Their writers are using illegal/legal methods to get essays out, and the customer service was not the best. If you’re in a hurry, you can’t rely on them. You’re better off with a better reviewed service. They’ll give you an 100% original essay, for a similar or even a better price. Learn more about their services from our edubirdie review. If you are looking for information about “can edubirdie write an essay on book topic”, welcome to Scamfighter!